My father ran the Catholic Truth Society shop in Abingdon Buildings but lived at 5 Burlington Place. I was in my mid-twenties at the time of the Bath blitz. 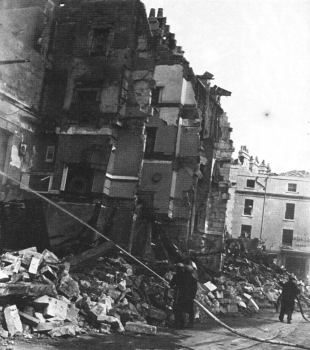 When the first siren sounded on Saturday 25th April, all the family werein the lounge in Burlington Place, including some relations, but they hurried away at the sound of the air raid siren. Unfortunately, they left the front door open and our dog, a black Spaniel, escaped. When the "All Clear" sounded, we all went to find our dog, but without success. Then the sirens went again. My Father and I went straight away to the basement but Mother wished to stay upstairs so as to be there should the dog return. The bombs started dropping once again and Father insisted that Mother should come down into the basement, and also some neighbours came down into our basement with their dogs and cats in baskets. Mother complained that she was cold, so Father went upstairs to fetch a coat. He was nearly back to the basement when the house collapsed and Father was pinned on the stairs and could not move. We thought that if we tried to leave the basement the rest of the house might come down and make matters worse. (The picture is not Peggy's actual house, but it shows the scale of damage in that part of Julian Road) So we started to shout for help, and this came six hours later. When we were free, we found that the escape route was into Rivers Street because so many buildings had been destroyed. Father was then rushed to the hospital and I went with him. At the hospital I saw a Willways Laundry van being used as an ambulance. Father had been very badly injured with facial and head injuries, and by the time he was discharged he had been in hospital for three months. When I returned from the hospital a man came along with a somewhat distressed dog that had been found on Cleveland Bridge. Yes, it was our dog! The next night we spent with friends in Oxford Row. We were safe in the basement there, though we heard continuous machine gunning in Lansdown Road, and after the All Clear sounded we witnessed a most horrific fire. It was the Assembly Rooms in flames. Number 5 Burlington Place was on the south side of Julian Road, and it was so badly damaged that it had to be demolished urgently in the interests of public safety. The records show that by the time the council completed its survey of damage in June 1942, it had already been demolished. Willways Dye Works and Laundry Co had premises in Walcot Terrace and Pulteney Bridge.